News & Updates Join Accessible Dispatch at the NYC Disability Pride Parade! In celebration of Disability Pride Month, please come out to march—or roll—with New York City’s disability community at the annual Disability Pride Parade. The Accessible Dispatch team will be taking part in this year’s parade on Sunday, July 15 from Madison Square Park to Union Square Park. Formation in Madison Square Park starts at 10 a.m. and the march begins at 11 a.m. The theme is “Express Yourself,” and the Mayor’s Office for People with Disabilities is encouraging everyone to be creative as we celebrate our Disability Pride. The parade has been held annually every July since 2015 as a celebration of the City’s disability community. The Taxi and Limousine Commission and MTM, the vendor for the Accessible Dispatch program, are proud to be participating. 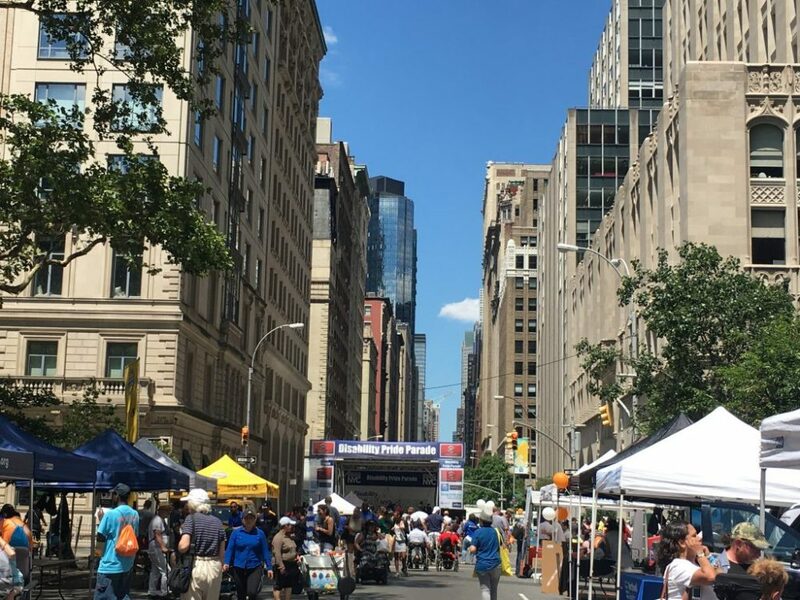 We will also have a booth in the Union Square festival area where we will be showcasing an accessible taxi and answering your questions about how Accessible Dispatch can help you access the city like never before. Please click here to register as an individual or organization. Don’t forget, you can conveniently book your ride to the parade with Accessible Dispatch by calling 646-599-9999, 311, or 711 for NY Relay; downloading the Accessible Dispatch NYC app; or clicking here to schedule your ride online. For drop-off at Madison Square Park for the beginning of the parade, request drop-off at 23rd Street and Madison Avenue. For pick-up at the end of the parade route, or drop-off at the festival site, request 14th Avenue and Union Square West. We hope to see you there. Happy Disability Pride!